In early September 2011, my 27 month old daughter Jovie was diagnosed with Autism and a developmental delay. She was also tested for Fragile X and Rett Syndrome. We knew for at least a year that something was maybe not quite right with her development but thought she would catch up eventually. Fragile X was ruled out within a few weeks. 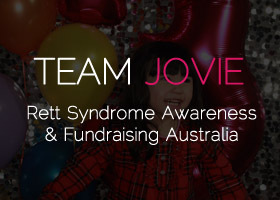 On the 7th of June 2012, we received the results of her DNA test – Jovie has Rett Syndrome. Our first video about Jovie & Autism has been posted here. Our video for World Autism Awareness Day 2012 was posted here. And the newest video of Jovie and Rett Syndrome in time for Rett Syndrome Awareness Month, October 2012. TeamJovie.com has been set up to pull together our awareness and fundraising events and campaigns. We were featured in the Rouse Hill Times paper’s website on September 19, 2012. Info from rettsyndrome.org. I’ve underlined the things Jovie does currently to get an indication of what we deal with everyday. Rett syndrome is caused by mutations on the X chromosome on a gene called MECP2. Rett syndrome symptoms appear after an early period of apparently normal or near normal development until six to eighteen months of life, when there is a slowing down or stagnation of skills. A period of regression then follows when she loses communication skills and purposeful use of her hands. Soon, stereotyped hand movements such as handwashing, gait disturbances, and slowing of the normal rate of head growth become apparent. Other problems may include seizures and disorganized breathing patterns, including hyperventilation, air swallowing and breath holding, while she is awake. Some children never learn how to sit up, crawl, walk or run. In the early years, there may be a period of isolation or withdrawal when she is irritable and cries inconsolably. Over time, motor problems may increase, but in general, irritability lessens and eye contact and communication improve. One of the biggest challenges for some girls is Apraxia – which can effect their whole body (from speech, use of legs, feet, arms, hands, head and even eyes). Apraxia is the most fundamental and severely handicapping aspect of Rett Syndrome. Rett syndrome presents many challenges, but with love, therapy and assistance, those with the syndrome can benefit from school and community activities well into middle age and beyond. If I could sum up what Rett Syndrome means for Jovie – it’s like being trapped in a body that just doesn’t work. Jovie is a smart, funny and clever young lady, she just needs extra help to grow and communicate with the world. There is no cure for Rett Syndrome, but they are currently working on it!